I have stumbled on a powerful story indeed. It is a tale which makes real storytellers’ eyes gleam with Fagin-like avarice. It is one of those stories one does not stumble across often. And I wasn’t even looking for it. I was looking for a nearby museum. Sure, I had seen the pictures of this diminutive cathedral-like church fashioned from the cannibalised remains of a Roman town and an ancient and powerful abbey. But the town of Cirencester is well named. Nestling at an ancient meeting of roads, it is filled with the siren call of Roman walls and amphitheatres and museums, and buildings made of golden Cotswold stone blocks, geometric and perfect like great overblown dolls houses. I followed my nose, into the great south porch of St John The Baptist church, a mediaeval treasure, a church with a story at every turn. It is known as the cathedral of the Cotswolds, a golden tower which rises high above the town and surrounding countryside with a ring of twelve bells. This building swells the heart. A kind guide found me craning my neck at the fan vaulting on the ceiling in the porch, and he said: come in. We have some glorious fan vaulting inside. His tour was a wonder. And about half way through, we found ourselves standing next to what looked much like a little glass-fronted safe box in the wall. Inside was the most exquisite siver-gilt goblet you have ever seen. Just one goblet: with a solid ornate base rising to a stem and cup of such elegance it fair takes one’s breath away. And over it all is a cover, topped with a figure which would be more at home on a coat of arms. The tiny figure has a history: perhaps you recognise it? A crowned white falcon standing on a tree stump. The stump is not altogether dead, for it sprouts red and white roses: and in the falcon’s talon is a crown and sceptre. It was a masterpiece of propaganda conjured for a short time: as long as it took for a king to become infatuated, and then, as quickly, fall out of love with his queen. The crest belongs, of course to Anne Boleyn. It was not her birthright, but fashioned to assert her right to be queen. And the cup: it was a love-gift from Henry. A thing of rare beauty. But Henry’s love never seemed to last long. The cup was made in 1535. By 1536 Anne was standing in a courtyard at The Tower, waiting impatiently for death to rock her asleep. 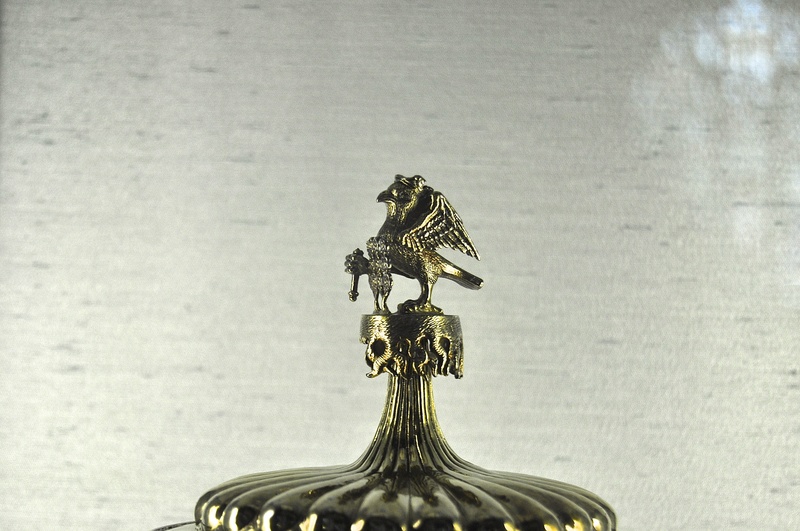 Death obliged, and the gorgeous silver cup, the symbol of Henry’s infatuation, fell to her daughter, Elizabeth. And she, in her turn, gave it to someone else. Her physician, Richard Master, was beneficiary; and somehow, he or his descendants bequeathed it to this little cathedral-like church in the Cotswolds. He had lately bought what was left of Cirencester Abbey from the Queen. The church first shows the cup in its records in a Vestry Book of 1614. And there it has stayed, for almost 400 years. Some years ago, Queen Elizabeth II visited Cirencester. She was given a tour round the church, my tour guide told me. And when she arrived at the little glass case, locals explained the background to the silver goblet which was so prized. But Queen Elizabeth had something to add. But of course, Henry VIII had one made for himself. The cup was one of a pair; the other, it seems , rests at Windsor Castle, where it has been handed down from that erascible man’s clutches to the silver collections of the present day. It remains to be seen if the two will ever achieve what their owners never did: reunion. Posted in Quirks of HistoryTagged Anne Boleyn, Boleyn Cup, Britain, england, historyBookmark the permalink. Wow, Kate, what a discovery. It’s especially precious to hear the Queen speak about it as though she knows every piece of her treasury. Ah, but by the looks of this elegant little goblet, no one would forget it. No: I’d say it was pretty unforgettable, Amy. I wonder what Henry’s is topped with? Wonderful piece of history. Could there be a script lurking in this, somewhere? How fascinating! Henry, when nice, was very very nice, that pair of cups seem to bear out. Of course, when he was bad he was truly horrid. Mind you, heads sat very uneasily on shoulders when their dear daughter was on the throne, too. True; I think her spouse-issues were infinitely preferable to his, though, Col.
Oh Kate! we could have bumped into one another – Anne’s cup is very familiar to me. A beautifully written account. Thank you, Rosemary. What a lovely unassuming little perch it has, there in that lovely church! I had thought the museum would give me the bulk of the stories but this beautiful place of worship won hands down! Beware of husbands bearing gifts. 😀 I think you have hit the nail on the head there, Jenifer. Or even chopped it off. Surprising, isn’t it, bearing in mind the rafts of silverware I always file past on our visits to Windsor Castle, Fiona? But endearing. Hi Aine, thanks so much for dropping by to read. Now I have to get after the other one at Windsor! Wonder where it is? Unfortunately, the same anecdote apparently occurs in one of the Arabian Nights tales, and that makes me suspicious of other reports of her wit. For example, she is said in 1574 to have described St Mary Redcliffe in Bristol as “the goodliest, fairest and most famous parish church in England”, but doubt has been expressed that this attribution is correct, the phrase first appearing, apparently, over a century later. But, as I can’t put my hands on the reference, don’t quote me on that! Cirencester is indeed a lovely town, with a rich heritage of architecture, history and archaeology. I particularly like the Roman remains in the museum, the display of which was being re-organised when I last visited nearly ten years ago. Red and white roses: I have tramped round Hampton Court many a time, Chris, and had her crest impressed upon me by whole posses of HRP guides :-D. I love the ‘forgot the fart’ story. It would be lovely if it were true…Must check out St Mary Redcliffe some time on one of our trogs to the West Country. The museum is a joy: ancient and modern, perfectly blended. What a very cool story and the piece is fabulous. Pleasure, Sidey. Such fun to find stories like that. I wonder which it was, Andra? What an absolutely wonderful story! What those cups have seen! I know! Standing close to it was quite exciting, Katie. Thanks for the link. It seemed vaguely familiar, or parts of it did.. Such fascinating history unfolding across the pond so long before this country even existed! Makes me feel like a babe in the world. Takes my breath away sometimes, PT. Always hated H8, always felt sorry for AB. You and the rest of us, Lame. Henry was a nasty piece of work. Poor Anne. The Tudors have provided a very good living for many writers and actors throughout the years. The cup is lovely. It is rather chilling to have a love gift preserved in church for hundreds of years, after the original owner was murdered. Almost in time for Valentine’s Day in a movie made by Tim Burton. Oh Gale, now wouldn’t that be a film to see? I have loved her story since I learned her song as a child. It is a lovely cup but minted in the year preceding her death? This is according to the church’s guide, Tammy, yes. I guess things moved quickly then. What a treasure! I love that Queen Elizabeth added to the history of the goblets. It does continually boggle my mind to contemplate the depth and length of British history…and here I am–I get so enflamed over anything more than a century old. 🙂 I’m delighted to see this storied goblet and whatever I’m lacking in knowledge about British royalty, there isn’t an American who isn’t fascinated with King Henry and Anne Boleyn! It’s an engrossing story, Debra, that’s for sure! American leaders are so virtuous (!) it’s difficult to generate any interest in American history. We gave up a lot when we got our independence. ….and yet I long to come over and investigate it, Kathy! Everywhere has its stories. I love that the Queen knows she has the other one. But she takes her role seriously and I understand she has a long memory. Indeed. A formidable woman, Tilly. Amazing, is it not, what we we find when we are not looking? I can imagine myself standing on the porch of St. John the Baptist and being led inside to see the wonders, especially this chalice. You outdid yourself in this telling, dear Kate. If I felt my daughter was the object of Henry’s affections, I would have sent her to some far-off, lesser-known country to rule over and to enjoy a full life. Your history yarns are always fascinating, Kate. Of course Her Majesty had the other.. Fantastic, Kate. And yet another place to visit. Yes, I had the same tale from the guide when I visited a couple of years ago and it thrilled me too. Visited again today and took a photo of the chalice.